Everywhere in this world we find heartache, strife, sickness, poverty, injustice and a host of other ills. Why can't men live in peace and enjoy the good things in this earth? The Bible (God's book to mankind) gives us the answer to these questions and tells us how to be born again and what that means. He tells us in His Book that all the troubles in the world are due to man's sin. Click here to find answers. The New Testament on DVD! Teachings that help you lay a proper and systematic foundation in the Word of God so you can become an overcomer in Christ! If Betty Miller's writings on this site have been a blessing to you, we are offering the Paperback Version of the entire Overcoming Life Bible Study Series. You will receive 9 books and 9 workbooks for a total of 18 books for the price of $200.00. Click here to order or read more information about this series. 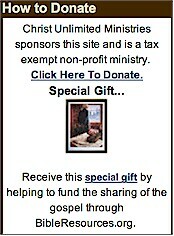 Ministers Bud and Betty Miller, directors of Christ Unlimited Ministries, are hosting this site. Their prayer is that you may be blessed as you visit the different areas in the site. They invite you also to pray for them as they carry on this work for the Lord. It is their full time ministry. Christunlimited.com helps you know and love God, while spreading the truth of the Bible to others, through the cutting edge of the Internet. This ministry touches people all over the world. Please ask the Lord if you are to be a part of this new evangelistic outreach that teaches others about Jesus Christ. We need your help. Your caring donations and prayers make a difference in the lives of hurting people who are seeking answers to their complex problems. We would be honored to represent you as your cyberspace missionaries. God is using this site for 21st Century Evangelism. We appreciate all who help us, not only by monetary gifts, but in the all important help of praying for us. "How To Recognize End Time Deceptions"
Wanna hear what kids like you have to say about God? Click the picture above to watch a video with real kids talking about God.